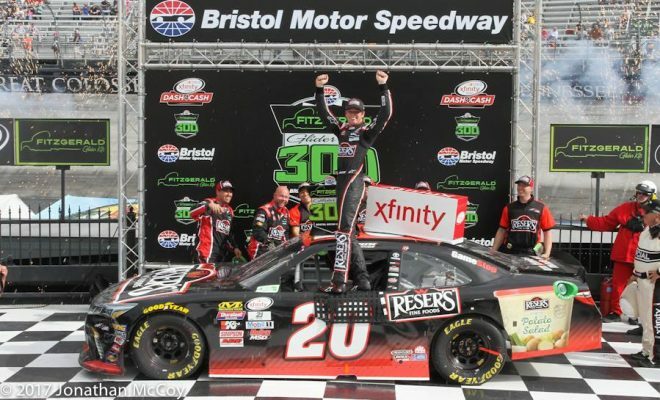 (NASCAR Wire Service) BRISTOL, Tenn. – Erik Jones found the ideal way to atone from a mistake in Saturday’s Fitzgerald Glider Kits 300 at Bristol Motor Speedway, but it took a bump-and-run for Jones to complete his comeback at the .533-mile short track. 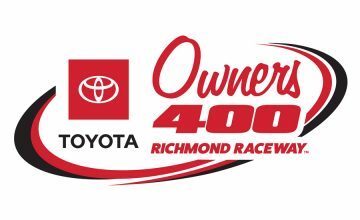 Recovering from a Lap 230 pit road speeding penalty that sent him to the back of the field, Jones worked his way to the front through a series of quick cautions and muscled Ryan Blaney out of the way to take the lead on Lap 280 of 300. Jones held the top spot the rest of the way, through a caution that slowed the race after William Byron, Justin Allgaier, Brennan Poole and Austin Dillon were involved in a Turn 4 wreck on Lap 291. The race restarted on Lap 298, but Blaney couldn’t get to Jones’ bumper to return the favor before the checkered flag waved. Blaney led the field to a restart on Lap 278, but Jones had superior speed on the short runs and quickly pulled up to Blaney’s bumper. As they raced hard into Turn 1, Jones applied the bumper of his No. 20 Toyota, sent Blaney’s No. 22 Ford up the track and made the decisive pass. “He was so much better than us on the short runs,” Blaney said. “He wasn’t going to back out, and I wasn’t going to back out either… I knew I pushed the issue with him. I knew he was close, and I don’t blame him for not backing out at that time. To Jones, the bump was justified by late-race urgency and the relative speed of his car. “At that point in the race I think there was less than 20 (laps) to go, and you have to do all you can to try to get to the lead,” he said. 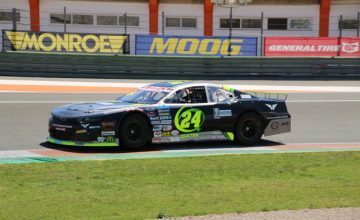 “I knew clean air was important, and we were quite a bit faster than the 22 just to fire off, and I guess just the track cooled down and we got some speed back in the car. It was a race of radically changing fortunes, and not just for Jones. Polesitter Kyle Larson led 180 laps, but cut a tire after contact with Brandon Jones’ Chevrolet on lap 261 – an incident that started a chain-reaction wreck that eliminated Cole Custer, Darrell Wallace Jr. and Garrett Smithley. Larson compounded his issues with a penalty for a commitment line violation but came from the rear of the field in the final 30 laps to finish seventh. Sunoco rookie Daniel Hemric came from a lap down to win the $100,000 Dash 4 cash bonus after the three other qualifiers for the XFINITY-sponsored prize – Custer, Allgaier and Brendan Gaughan – all were involved in accidents. Hemric finished fifth behind Daniel Suarez in third and series leader Elliott Sadler in fourth.